Count on Chelsea Clock for Convenient, Quality Service. All Repairs are Backed by Our Two-Year Warranty. Send your old or damaged antique clock to us and our skilled clockmakers will thoroughly examine it and provide a free estimate. We service dozens of different clock brands in addition to Chelseas, including Howard Miller, Hamilton, Hermle, and others. Check out our Brands We Service page to see a complete listing. 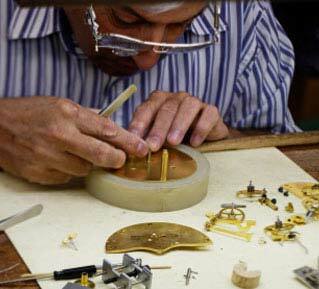 After your clock is serviced, Chelsea Clock stands behind it with a full, two-year warranty on all parts and service.